The benefits of fennel date back to the ancient Egyptians and Romans. They used fennel for spiritual and emotional support. Today it is supportive to healthy circulatory, glandular, respiratory, and digestive systems*. Spiritually warriors believed that it gave them courage and strength in battle and longevity. During the Medieval Age, fennel was used to block spells and ward off witches and evil spirits. Today, we can reap the benefits of fennel using fennel essential oil every day. It can assist us with supporting a healthy digestive system. It also is supportive of healthy circulatory glandular and respiratory systems. We also know that fennel is used for culinary purposes, especially in Mediterranean cuisine! It is amazing that something we have used for culinary use for thousands of years. Want to Purchase Therapeutic Grade Fennel Oil? Go to the Oil Shop! 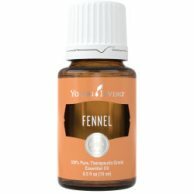 Buy Fennel Essential Oil Here! Why is this information important? There are many species of fennel including poison hemlock which is not an edible plant. So please remember to purchase your oil using the common name and the genus species! Note about Fennel Chemistry: Fennel and anise are composed of the ether anethole which makes them almost identical for aromatherapy use. So if you don't have fennel use anise! This is a unique situation and doesn't occur that often with essential oils but I thought I would note it. More benefits of fennel! What is the Origin of the Plant Name? Fennel comes from a Latin word "fenum" meaning "hay". Did you know that Fennel is contained in Hildegard’s Physica Book? Hildegard of Bingen (1098-1179) was known as the first herbalist and naturopath of the middle ages. Her book documented her work. What are the Documented Uses and Benefits of Fennel? It is supporting to healthy circulatory, glandular, respiratory, and digestive systems. What is the Aromatic Effect on the Mind? Its sweet and spicy aroma promotes courage and is balancing. You may recognize the licorice scent! What is the Spiritual Influence? We also know that Fennel benefits the spirit! Fennel will give us courage to look at the part of the self that lacks self love. It gently forces us to look at our own rejection of self due to self image and victim mentality. It is good for those of us who are challenged by weight fluctuations which may have a root of feeling unloved, not worthy to accept love or not being able to love ourselves for who we are. It also helps us ground to mother earth energy. And it may open your awareness to suffering that takes place on earth. It will help us understand and accept the spiritual reasoning behind such suffering so we can embrace earth energy and our spiritual work. What Chakra is Affected? Fennel benefits the base, sacral, solar plexus and heart Chakras. Interested in Dietary Fennel Oil for Your Culinary Adventures? Then check out Fennel Vitality Essential Oil! Note about Animal Use: Certain oils can be very toxic to cats especially when poor quality oils are used. Pine and citrus products and oils in particular. Please consult your vet if you are not sure about applying any essential oil to your pet. What are the Safety Precautions? First, only use therapeutic grade essential oils for best results! Because it is improved as a Food Additive (FA) by the FDA, food grade fennel oil is readily available on the market. Please remember, these are not the same oils and are often adulterated (changed). One of the benefits of fennel oil is that is has no know contraindications and it is generally regarded as safe (GRAS). However, repeated use may result in contact sensitization. And women who are pregnant or those who are susceptible to epilepsy should use caution. Did you know that Fennel is in the Parsley Family? Did you know that Fennel was called by the Ancient Romans the "herb of sight"? Use Fennel Essential Oil in conjunction with Vitaflex around the ankles to support a healthy endocrine system. Refer to Vita Flex Chart.